Jain suffered a cardiac arrest. 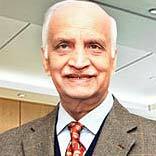 The founder and chairman of India’s leading pen manufacturer, Luxor Group, DK Jain passed away on Wednesday. Jain, was 71 years old, and suffered a cardiac arrest at his residence. Jain had also distinguished himself via philanthropic activities and as Chairman of Luxor Foundation, sought to spread education amongst the underprivileged. He is survived by wife, son and three daughters.